With the multiplication of Access Network technologies (xDSL, FTTx, 2G/3G/4G… and 5G), and growing customer expectations in terms of network reliability and Quality of Service, Network Field Operations are a heavy burden on telco P&L, representing as much as 15%-20% of total OPEX. Among the levers to ease this burden, RPA (Robotic Process Automation) and AI (Artificial Intelligence) appear to be some of the most promising ones, by enabling automation of time-consuming tasks and unlocking new efficiency thresholds. The proven maturity of RPA and the more recent introduction of AI commercial solutions allow advanced use cases, such as a fully automated data entry process (zero human intervention) or a self-learning supporting system, to become a reality. Learn how Capgemini Consulting are helping telco operators harness the power of RPA & AI to optimize field operations costs. Faced with the challenge to cut its Network OPEX by 25% in 5 years’ time one major European telco operator has chosen RPA as a major driver to reach this ambitious goal. Why? Because RPA is the near-guarantee to deliver quick wins on volume-heavy tasks. And telco field ops are full of volume-heavy tasks: millions of interventions per year, leading to millions of similar-looking intervention reports, serving millions of customers and involving armies of technicians and back-office support teams. RPA can replicate a set of tasks on one or several IT applications, like finding information and filling forms, providing that the data and the form field’s locations don’t change and that related processes can be fully described (with possible decision trees). It seems quite limited, but we will see it can be incredibly efficient to generate significant savings. By nature, RPA can save thousands of working hours by automating repetitive tasks. If there are 100 people spending 5 min each day working on the same task, it is possible to save approx. 2000 hours of work with the right RPA solution, which results in circa 100k€ annual savings. While not very impressive compared with big IT projects that target gains in millions of savings, the key asset of RPA is that it has become increasingly fast to build and fast to implement. Fast to build as the RPA market now offers off-the-shelf solutions with intuitive development frameworks (some, like UI Path, are even code-free) that enable automation of simple tasks, such as reading a standardized .pdf file, filling a form or an Excel sheet, fetching data through an API or sending standardized emails. Fast to implement because RPA solutions are often non-intrusive and usually need very little change management, if any. With as few as 5 developers, we helped a European telco to deliver over 3M€ recurring annual costs in just a few months, from opportunity identification to implementation. We used Wintask, a technology already implemented by our client to automate simple back-offices processes such as copy-pasting data from one application to another, filling web forms or fetching data in applications. Benefits from RPA are not limited to workforce savings. It can be a strong lever to augment data quality: one of our clients noticed that more than 40 000 devices were incorrectly described in the IT system because entering intervention records’ data was performed manually and thus exposed to human errors. Acknowledging incorrect data description is a huge factor of intervention failures, as it can lead to technicians being sent in the wrong place or with the wrong tools (or skills) to perform the repair. We are overseeing the implementation of an RPA solution to automatically fetch data from field intervention reports into the IT system, which should drastically increase data quality and improve “Right first Time”. Where are RPA’s low hanging fruits? It is clear that RPA is a robust solution to automate simple and repetitive tasks. Yet there are so many such tasks on a day-to-day basis that companies can be easily drowned in the ocean of what RPA can automate. Hence, with limited resources, where are the most promising use cases? A good candidate for RPA must comply with the “Short Duration – High Volume” rule. Short duration typically means tasks between 1 and 15 minutes. Some good use cases beyond this 15-min threshold can be found, but it usually means the task is too complex for RPA solutions. High volume depends on the duration of the task (see table below), but it is generally assumed that if a task is performed less than 10 000 times a year, it is probably not worth automating it. With this simple rule of thumb, opportunities can be easily qualified, but the main difficulty lies in detecting the opportunity in the first place. It is difficult since the only people who know precisely how repetitive and time-consuming a task can be are the operators who perform it. Yet they often barely have the time or RPA skills to put in place an automation routine. Therefore, a strong RPA implementation team brings together an operator who knows the tasks, an RPA expert who knows what can be automated and a business owner who knows how often the task is performed overall and what is the gain of automating it. While RPA is a good solution to deliver quick and easy savings, it has limitations. First, by design, RPA solutions mainly simulate human clicks in GUIs, which risks overloading applications unable to manage a large volume of clicks within a limited timeframe. Second, RPA routines are not resilient to change. If an application evolves, there is significant chance that the robot needs to evolve as well. Thus, RPA is often a temporary solution awaiting a more viable IT redesign project or a process overhaul (which are often mid to long term evolutions). For its savings potential, RPA has already seduced field operations management boards, but not only. A common mis-belief is that RPA is badly perceived by employees who fear being replaced by machines. So far, we are witnessing the opposite, as RPA is welcomed by employees themselves as a mean to free them from alienating tasks (like copy-pasting data from one application to another for a couple of hours). 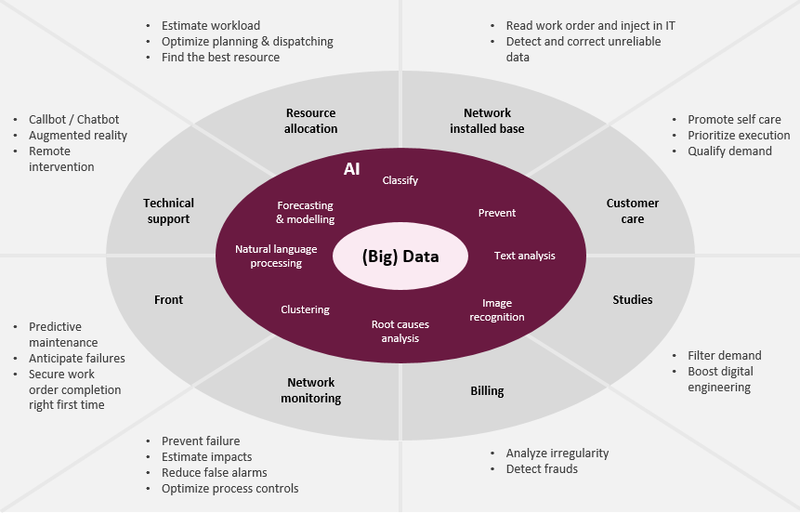 Where RPA enables the optimization of well-defined tasks, AI promises to replicate human intelligence in its ability to identify new optimization opportunities, find solutions to different problems, or realize that something is wrong and fix it. More complex tasks are quite common within a process of Field Ops: reading a technical plan, analyzing pictures of technical infrastructures, extracting information from a messy document, quickly analyzing root causes for failures and identifying the relevant levers to fix it. With the growing accessibility and reliability of AI algorithms, a new set of tools have emerged to automate more complex, unstructured procedures. A tool like Workfusion offers an end-to-end CPA (Cognitive Process Automation) solution which can detect information in non-standard documents. In another use case, IBM is providing image analysis & recognition tools, exposed via their Watson API, which can be easily integrated in an RPA solution such as UIPath. For one of our telco clients, we are currently exploring automation of document / image recognition and classification to identify whether a technical record is accurate. The solution is being trained to recognize quotes, picture of connection points, intervention reports… with a potential of several millions of euros of annual savings. Even automation of speech recognition, speech to text and voice generation is now a reality that can be applied to Field Operations. While telco operators have seen the potential of conversational bots to automate part of their customer service & sales – Nugu for SK Telecom, Djingo for Orange, Tobi for Vodafone… – telcos have left the potential of conversational bots for technicians largely untapped. 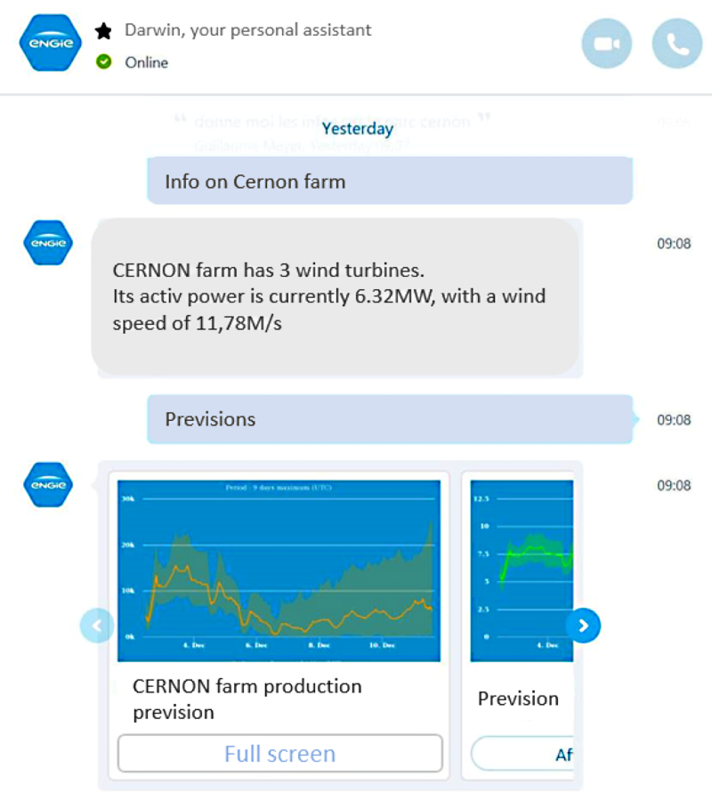 Engie, the French utility company, released in late 2017 a chatbot for technicians to provide them with real-time data on an equipment depending on their request. There are many benefits of conversational bots for telecom technicians. One of our clients, like all its competitors, invested a massive amount of money to develop mobile tools so that their technicians can autonomously perform simple tasks such as testing and configuring a device, finding an information about the customer or provisioning the IT system. Although these solutions are clearly a must-have for efficiency gains, our client quickly witnessed their limits: a clear majority of technicians prefer calling their support teams as it is often more convenient than logging into an app, finding the right button, entering the information in the app, when they can call support while manipulating the equipment they are intervening on. Keeping this in mind, our client asked us to evaluate opportunity of a callbot for network field technicians. Ten reasons for calling have been short-listed for: being the most frequent and being of relatively low complexity to process / solve. Examples of good use cases are the automatic supply of the CPE ID data, or the swap of two copper pairs. The project is being tested but we are hopeful it will reduce phone calls to the support team by circa 15%. Augmented employee: if AI can’t do it, can it help? Still, even with the emergence of CPA and callbots, technology is facing difficulties to replicate some processes from end to end, with 100% reliability. Sometimes machines simply cannot do it, or the criticality of a task is too high to be autonomously managed by a robot. For example, AI is not (yet) able to replace a human to modify key data in the IT system, approve a quote or call a customer (despite recent demos by Google Duplex). However, if AI cannot beat humans there, it can help them perform those tasks way faster and in a better way. To illustrate this concept, one key data for Field Operations is the address of a customer or of an equipment. The main problem of these addresses is that they change quite often at a country scale (street changing name, house changing number or even a town merging with another one). For an operator managing millions of addresses, it can be hard keeping track of those changes. At our clients, hundreds of people thus worked to update addresses in the IT system using several external databases (government, post service, …). We are currently working with their IT teams to train an AI to detect hidden rules in their street names corrections and to suggest the next best action. Since this is key data, a robot cannot be fully trusted to take the best decision each time, hence employees do validate or correct the robot’s suggestions, thus increasing the robot’s success rate. We are targeting 20% savings off this activity thanks to this solution. Another example is the leverage of anomaly detection algorithms which can automatically predict outliers. This use case is particularly relevant in the Billing teams who screen subcontractors’ invoices to detect frauds. For a big telco player analyzing millions of invoices each year, we observed that the tools used by the reviewing teams could be optimized with such Machine Learning algorithms to reduce false detections (see below) thus minimizing back-office activities and risks of incorrect invoices payment. But does AI really work? There is no clear answer yet. Particularly within the area of Field Operations, where use cases are still less mature compared to sales, marketing and customer service units. Nevertheless, this is a reason why it should be tested now. Field ops managers need to test a maximum number of ideas to identify the most valuable levers. If they succeed, they have the potential to make huge savings, if they fail, they will at least learn to master a technology which can be difficult to grasp and will serve in the future. To do so, field operations need to adopt a proper structure to detect, prioritize and test use cases in short cycles. In one of our recent publications (Capgemini Digital Transformation Review – April 2018 issue on Artificial Intelligence), Michael Natusch from Prudential Plc revealed they only give a POC 3 days to prove its worth. If it is still promising they extend the trial by a few months, if not they pass on to the next idea. We try to push this mindset: working in tandem with the R&D teams of our clients, we can trial an image classification prototype in a week. At Capgemini Consulting, we already have implemented dozens of initiatives in RPA and AI, leading to solid results for our telco customers. Thanks to our cross-industry knowledge and the support from our technological teams at Apps and Sogeti High Tech, we combine know-how, implementation experience, in-depth understanding of available solutions and vendors to help telcos successfully implement RPA and AI initiatives in Field Operations for both front & back office activities. With the maturation of technologies and market solutions, additional opportunities will arise to help Field Operations tackle the huge challenges ahead. Trying out available solutions right now appears to be the right move to avoid being left behind in the race to automation. Nicolas Clinckx has 20 years of experience in Strategy and Management consulting. He is a recognized expert in Network and Field Services having a long history of driving transformation projects for telco operators (Orange, BT, SFR, Bouygues Telecom, TDF, …) and more broadly leaders of field services in both B2B and B2C. Prior to joining Capgemini Consulting, he worked at Celerant, Oliver Wyman and EY Parthenon. At the beginning of his career, Nicolas spent 5 years working for International divisions of Suez in Corporate Strategy and Business Planning in the UK and Canada. He is a Certified Digital Expert with extensive experience in New Business Models, Digital Customer Experience and Digital Operations: RPA, Artificial Intelligence, Contribution of Big data and Advanced Analytics to redesign Target Operating Models – improving efficiency while enhancing the Quality of Services. Nicolas regularly contributes to studies, publications and other forums on Digital Transformation. SAS Analytics Experience 2018: What to expect?